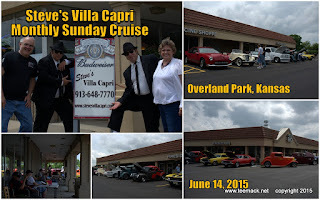 Steve's Villa Capri in Overland Park, Kansas hosted a Sunday Cruise for classic car, hot rods and street rods. There were approximately 50 vehicles that attended the monthly cruise. This was the first cruise for Steve's Villa Capri and hopefully many more to come. The weather had rain in the forecast but didn't stop the cruisers from coming out to enjoy the great Italian food at Steve's Villa Capri on June 14, 2015. Click here to view photos of the event.